This section of 360 consists of feeder roads only. South of 183, 360 is a full freeway. Contracts to construct the freeway are currently scheduled for letting in 2002 and 2004. (See table below). Early 1990's Frontage Roads constructed. 2002 Scheduled contract letting for 4 freeway mainlanes from Mid-cities Boulevard to freeway northern terminus at 121, a $19.2 million project. 2004 Scheduled contract letting for 6 freeway mainlanes from Mid-cities Boulevard to existing freeway at 183, a $15.9 million project. 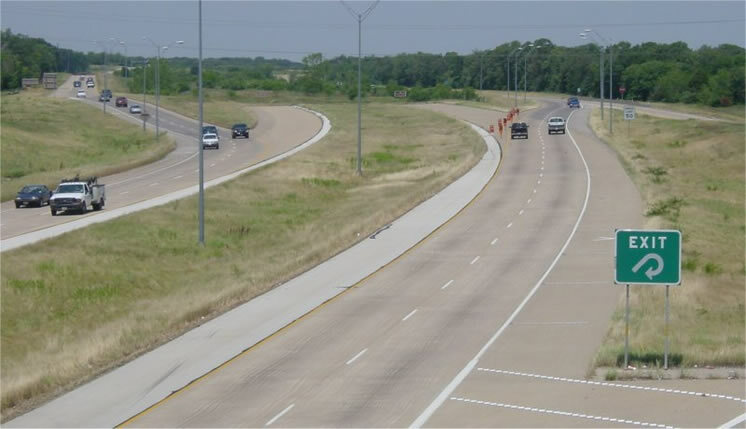 This will complete the freeway between 183 and 121. Photos taken May 14, 2001. (high resolution 122k) Looking north along 360 from just south of 183, where 360 is a freeway. The ramp connects westbound 183 to southbound 360. This wide span of concrete at the northeast corner of the intersection of 360 and 183 appears to be one of the last remains of the Amon Carter Airport (also called the Greater Southwest Airport) that existed at this location until the construction of DFW airport, which opened in 1973 or 1974. Most of the Amon Carter airport was actually on the southeast side of the 360/183 intersection. (high resolution 110k) Embankment stockpile in the median of 360 just north of 183. (high resolution 171k) Looking north at the intersection with Mid-cities Boulevard, which features a grade-separated overpass and a short section of freeway main lanes. One of the DFW control towers can be seen in the background. (high resolution 171k) Looking north from the Mid-cities Boulevard overpass. This interchange features cloverleaf connections, which are still being included in some new DFW freeways in connections with arterial streets. (high resolution 179k) Looking north along the feeder roads between Mid-cities Boulevard and the freeway terminus at 121.